Memberships are valid for one year from the date of registration. Please join us today! 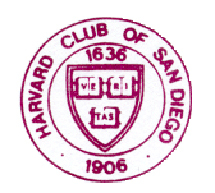 The Harvard Club of San Diego may from time to time publish on its website or its newsletter pictures of club members and guests who attend club events. If you see your picture and would prefer to have it removed, please contact hcsd.centennial@gmail.com.